The activists say that it’s necessary for Hiasl to be legally declared a ‘person’ so he can receive personal donations and have an appointed guardian to look out for his interests. However, with the publicity that Hiasl has now received, it seems very unlikely that he would be sold off to a country with lax animal cruelty laws, as the animal rights group fears. Hiasl’s profile has more than likely been raised enough to ensure that he will survive and be given abundant care. So why pursue the case to have him legally declared a ‘person’? In the image of … ? The animal rights activists base their judgments on an evolutionary worldview. Evolution says that all species are related through ancestry. That means that the differences between us and our evolutionary relatives is one of degree, not kind. Therefore, they infer, there is no absolute, qualitative basis for treating any other creature any differently from our fellow humans. In their attempt to ‘upgrade’ the status of animals like the chimp by basically equating them with humans, they downgrade humans by saying that we’re just animals. 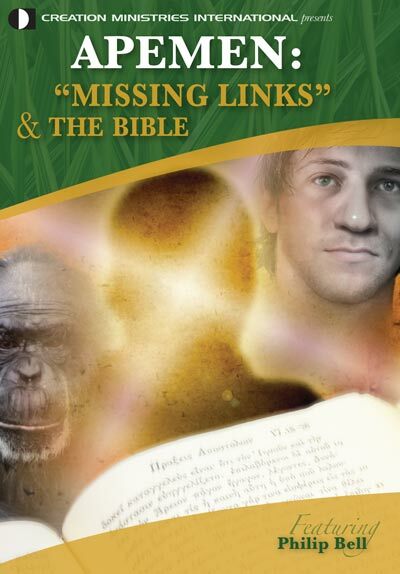 However, the Bible states that of all the creatures that inhabit the earth, God created man alone in His image. This gives humans the special privileges of being able to relate to God and of ruling His world under Him, but also gives us the responsibility of obeying Him. Since animals were not created in God’s image, they share neither the rights of humans nor their responsibilities because God is a God of justice. It is unfair to give rights to those who cannot handle them, just as it is unjust to give responsibilities to those who can’t fulfil them. Even Balluch acknowledges that chimps are not human, but he appears to imply that the percentage similarity to humans grants chimps the right to a similar percentage of human rights (perhaps rounding up the percentage for the rights calculation?). However, we also share about 50% of our DNA with bananas. As prominent evolutionist Steve Jones pointed out, ‘that doesn’t make us half bananas, either from the waist up or the waist down.’3 Neither does it make bananas half human, or entitle them to half the rights humans enjoy. If it did, which rights should we afford bananas, and which should we withhold? Should they, say, be afforded the right to hold property, but denied the right to vote? According to the Bible, God did not create an interspecies democracy. He created humans alone in His image to rule over the other creatures He created. With the rights that are ours because we are created in God’s image come appropriate responsibilities as well that no other creature is expected to uphold. It is our responsibility as the God-ordained stewards of this planet to make sure we take care of these creatures. Proverbs 12:10 says that ‘a righteous man cares for the needs of his animal.’ A creature does not need to be classed as a human to be treated humanely. 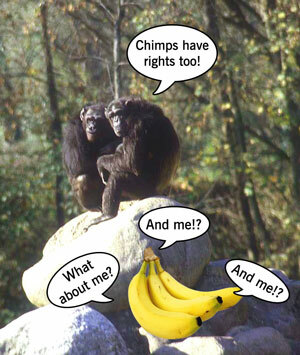 Kole, W.J., Activists want chimp declared a person , 5 May 2007. Return to text. Tough animal rights law, New York Times, 28 May 2004. Return to text. Jones, S., interviewed at the Australian Museum on The Science Show, broadcast on ABC radio, 12 January 2002, http://www.abc.net.au/radionational/programs/scienceshow/almost-like-a-whale/3504048, 13 February 2012. Return to text.